You know those Marie Callender's frozen pot pies that cook in the microwave? But, unfortunately, it was one of those abusive relationships that you don't realize you're in. Everyone around you sees it, but you just don't... it seems so perfect from the inside... Until someone intervenes & fills you in on what your relationship actually looks like, and what it's doing to you. So you have to break up. Until the Paleo diet comes into my life, introducing me to foods that I can love again & not feel afraid. That I can trust, for real this time. 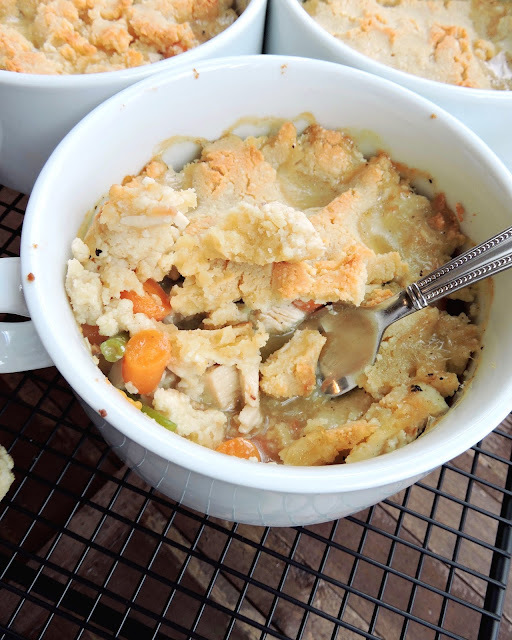 Thanks to some of my favorite Paleo ingredients (coconut milk, chicken broth, ghee, meat, veggies, and a couple Paleo-approved flours), I can be friends with Chicken Pot Pie again. And this time it's for the long haul. Enjoy~ and keep in mind that all of these ingredients are trust-worthy compliant, even for you Whole30ers... 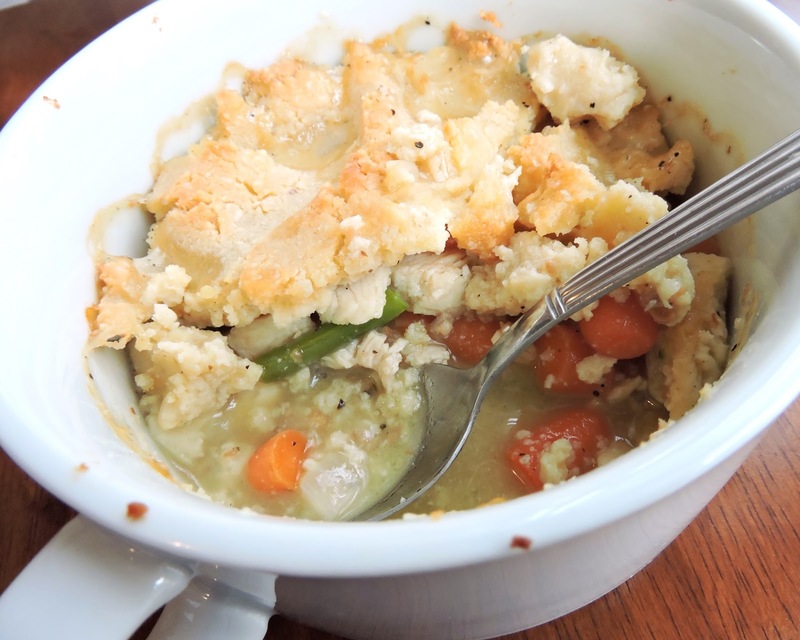 It's just up to you whether the "crust" topping & overall deliciousness of this pot pie makes this a SWYPO* food. If so, you could always go "crust-less"! In a medium mixing bowl, combine the crust ingredients to form the "dough" for your topping~ then set aside. 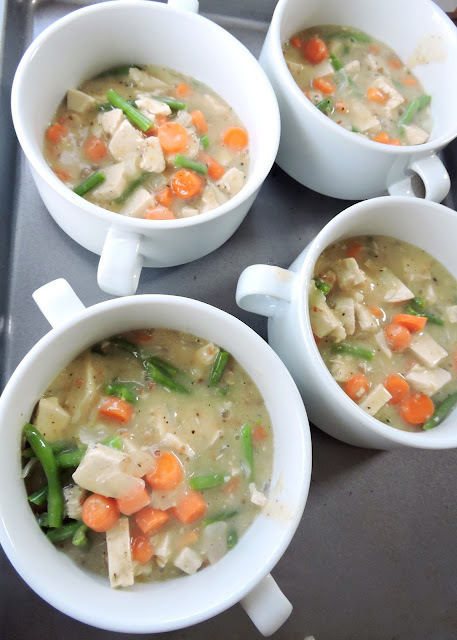 Combine the broth and coconut milk (for your "filling") in a small bowl & keep it by the stove. In a large skillet, melt the butter or ghee over medium heat. Add the onion & garlic, and cook for about 2 minutes, stirring often, until soft. Stir in the arrowroot flour using a wooden spoon or rubber spatula. Slowly and gradually pour in the broth/coconut milk mixture a little at a time, while continuously stirring. Continue cooking & stirring for a couple more minutes, until it becomes thickened and bubbly. Add the cooked chicken and vegetables of your choice (the vegetables should be raw), stir, then remove from the heat. Season with salt & pepper to taste, and stir in crumbled bacon if you like. Bake at 400ºF for 30 to 35 minutes, or until the crust is golden brown. Let the pot pie sit for a few minutes before serving. Substitute tapioca or coconut flour for the arrowroot flour, for a slight texture difference. Coconut flour is a bit more "gritty" but would still work if that's what you have on hand. 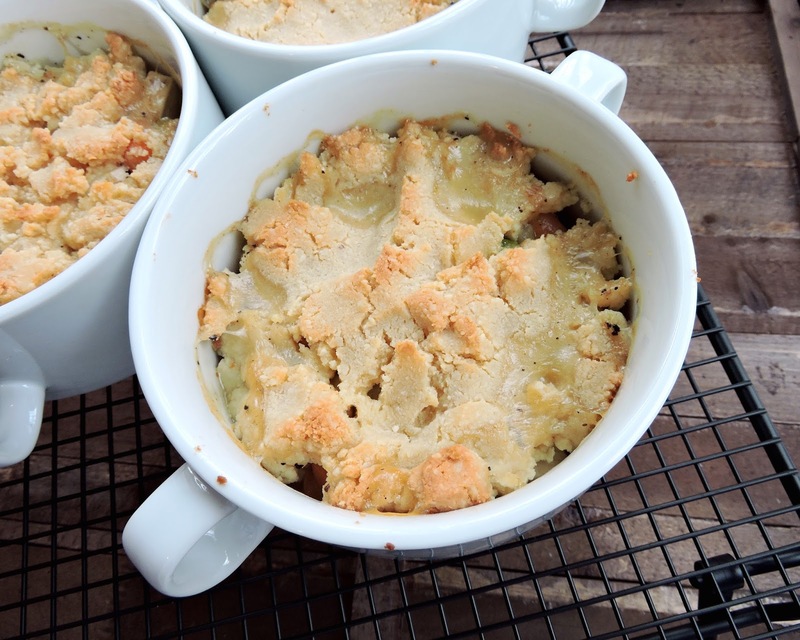 I used four 20-oz oven safe bowls, but you could also use a 9 x 9" baking dish. If you use a large 9 x 13" baking dish, you may need to make more "crust". I found your blog through a Whole 30 group on Facebook and I just wanted to tell you how much I'm enjoying browsing around! I think I've pinned about 20 recipes so far. They all look so yummy, I can't wait to try a few. Oh, and thanks so much for "keeping things PG", I really do appreciate that a lot! Have a great day! I'm happy you found me, Carol! And I appreciate you noticing my "PG-ness". It's important to me too! :) Thanks so much for your comment. How would I make this without the eggs?